Subsiding OOB Emission and ICI Power Using iPOWER Pulse in OFDM Systems, KAMAL, S., AZURDIA-MEZA, C. A., LEE, K.
Power System Stability Improvement through the Coordination of TCPS-based Damping Controller and Power System Stabilizer, ALI, M. A. S., MEHMOOD, K. K., KIM, C.-H.
A Comparative Parametric Analysis of the Ground Fault Current Distribution on Overhead Transmission Lines, VINTAN, M.
Advances in Electrical and Computer Engineering® (Adv. Electr. Comp. Eng. - ISO4 abbreviated title) is an open access, peer-reviewed journal published by the Stefan cel Mare University of Suceava. 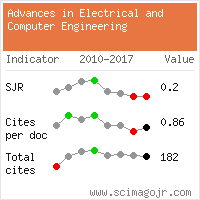 This journal is indexed and abstracted in Science Citation Index Expanded® and Journal Citation Reports/Science Edition® by Clarivate Analytics (former Thomson Reuters / former ISI), SCOPUS® (Elsevier), INSPEC® (IET), and many other international databases and directories. A full list may be found in the About section. The Journal policy is to publish high quality original scientific articles with permission from the Editorial Board. The principal aim of the journal is to bring together the latest research and development in various fields of science and technology such as electrical engineering, electrotechnics, electric machines modeling and design, control of electric drive systems, non-conventional energy conversion, sensors, electronics, communications, data transmission, energy converters, transducers modeling and design, electro-physics, nanotechnology, computer science, artificial intelligence, pattern recognition, knowledge engineering, process control theory and applications, distributed systems, computer networks and software engineering. Papers must be written in English and they must not have been previously published and should not be under consideration for publication elsewhere. In eighteen years of existence, researchers from more than 50 countries have chosen AECE journal for the submission of their manuscripts and high profile researchers from 15 countries have joined AECE International Scientific Board. The Editorial Board is looking forward to further improve the quality of AECE journal and to broaden the impact of AECE articles. We provide on-line full-text free access to all published papers. Permanent links to published papers are maintained by using the Digital Object Identifier (DOI) system by CrossRef. Information provided by Computing - MIT Technology Review. Website conception, design and maintenance by Eugen COCA. Content updated on 28 Feb 2019. Site engine updated on 28 Feb 2019. This page was generated on the server in 0.110 seconds and loaded in your browser in > seconds.